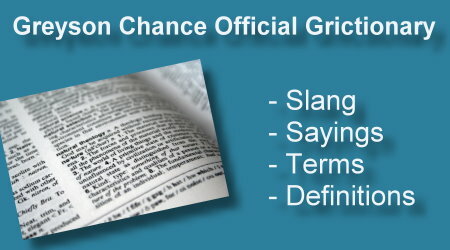 Second Edition Official Dictionary (Grictionary) of Greyson Chance slang, sayings, terms, definitions, and abbreviations. #Ninja – One who possesses the ability to stalk Greyson’s every move while obtaining new and rare photos, video, and news. Greydorable – The ability of Greyson to to appear both adorable and Grexy at the same time. Grustache – That small patch of fuzz Greyson gets above his lip after not shaving for a week. Would you like a tic tac? – One of Greyson’s Ninja pickup moves he uses when first meeting a pretty girl. Grictionary – This! The official dictionary of Greyson Chance slang, sayings, terms, and abbreviations. Just kitten - A phrase meaning "Just kidding." Normally used after the question "Do you want to hear about my new cat?" The following definitions will only mean something to a small number of Enchancers who have special training and are wise to the meaning of their use. All we ask is that you invoke them with care and never out of anger, greed, envy, pride, or revenge. If you find any typos or have suggestions for our Grictionary just leave a comment or tweet them to @GreysonChanceU with the hashtag #Grictionary and we will add it to the list. Thanks to everybody who helped compile the first edition of our Official Greyson Chance Dictionary of Words, Terms, Slang and Spells. Welcome to "The Grictionary" and the art of speaking Greylish! Yay, you used Oreo! (That was my idea :D) I'll be showing this to all my friends and using these grepic words whenever I can! What's Grenis? Ive seen people use it. whooooaaahh hahaha only enchancers can make their own grictionary gruper grexciting...! can i suggest some words on your grictionary? greetie- when greyson call his fan sweetie during interview or press conference. I have them all memorized!! OH YEAH! I Think You Should Add 'plz' Because Greyson Tweeted It When Asking Micheal To Give Him The Chords. Thanks Love Y'All!! grenis for greyson manis or... yeah you know. greyson's pe**s lol! grictionary is cool and i love this!! !